The objective of this chapter is to help you learn some of the common market terminologies, and concepts associated with it. Bull Market (Bullish) – If you believe that the stock prices are likely to go up then you are said to be bullish on the stock price. From a broader perspective, if the stock market index is going up during a particular time period, then it is referred to as the bull market. Bear Market (Bearish) – If you believe that the stock prices are likely to go down then you are said to be bearish on the stock price. From a broader perspective, if the stock market index is going down during a particular time period, then it is referred to as the bear market. Trend – A term ‘trend’ usually refers to the general market direction, and its associated strength. For example, if the market is declining fast, the trend is said to be bearish. If the market is trading flat with no movement then the trend is said to be sideways. Face value of a stock – Face value (FV) or par value of a stock indicates the fixed denomination of a share. The face value is important with regard to corporate action. Usually when dividends and stock split are announced they are issued keeping the face value in perspective. For example the FV of Infosys is 5, and if they announce an annual dividend of Rs.63/- then it means the dividend paid is 1260%s (63 divided by 5). 52 week high/low – 52 week high is the highest point at which a stock has traded during the last 52 weeks (which also marks a year) and likewise 52 week low marks the lowest point at which the stock has traded during the last 52 weeks. The 52 week high and low gives a sense of the range within which the stock has traded during the year. Many people believe that if a stock reaches 52 week high, then it indicates a bullish trend for the foreseeable future. Similarly if a stock hits 52 week low, some traders believe that it indicates a bearish trend for a foreseeable future. All time high/low – This is similar to the 52 week high and low, with the only difference being the all time high price is the highest price the stock has ever traded from the time it has been listed. Similarly, the all time low price is the lowest price at which the stock has ever traded from the time it has been listed. Upper Circuit/Lower Circuit – The exchange sets up a price band at which the stock can be traded in the market on a given trading day. The highest price the stock can reach on the day is the upper circuit limit and the lowest price is the lower circuit limit. The limit for a stock is set to 2%, 5%, 10% or 20% based on the exchange’s selection criteria. The exchange places these restrictions to control excessive volatility when a stock reacts to a certain news related to the company. Long Position – Long position or going long is simply a reference to the direction of your trade. For example, if you have bought or intend to buy Biocon shares then you are said to be long on Biocon or planning to go long on Biocon respectively. If you have bought the Nifty Index with an expectation that the index will trade higher then essentially you have a long position on Nifty. If you are long on a stock or an index, you are said to be bullish. Short Position – Going short or simply ‘shorting’ is a term used to describe a transaction carried out in a particular order. This is a slightly tricky concept. To help you understand the concept shorting, I’d like to narrate a recent incident that happened to me at work. If you are a gadget enthusiast like me, you would probably know that Xiaomi (Chinese manufactures of Smartphone) recently entered into an exclusive partnership with Flipkart to sell their flagship smart phone model called Mi3 in India. The price of Mi3 was speculated to be around Rs.14,000/-. If one wished to buy Mi3, he had to be a registered Flipkart user, the phone was not available for a non registered user, and the registration was open only for a short time. I had promptly registered to buy the phone, but my colleague Rajesh had not. Though he wanted to buy the phone, he could not because he had not registered on time. Out of sheer desperation, Rajesh walked up to me, and made an offer. He said, he is willing to buy the phone from me at Rs. 16,500/-. Being a trader at heart, I readily agreed to sell him the phone! In fact I even demanded him to pay me the money right away. After I pocketed the money, I thought to myself, what have I done?? Look at the situation I’ve put myself into? I’ve sold a phone to Rajesh, which I don’t own yet!! But then, it was not a bad deal after all. I agree, I had sold a phone that I dint own. However I could always buy the phone on Flipkart, and pass on the new unopened box to Rajesh. My only fear in this transaction was, what if the price of the phone is above Rs.16,500?? In that case I’d make a loss, and I’d regret entering into this transaction with Rajesh. For example if the phone was priced at Rs.18,000 my loss would be Rs.1,500 (18,000 – 16,500). However to my luck, the phone was priced at Rs.14,000/-, I promptly bought it on Flipkart, upon delivery, I handed over the phone to Rajesh, and in the whole process I made a clean profit of Rs.2,500/- (16500 – 14000)! If you look at the sequence of transactions, first I sold the phone (that I dint own) to Rajesh, and then I bought it later on Flipkart, and delivered the same to Rajesh. Simply put I had sold first, and bought it later! This type of transaction is called a ‘Short Trade’. Going back to stock markets, think about this very simple transaction – on day 1 you buy shares of Wipro at Rs.405, two days later (day 3) the stock moves and you sell your shares at Rs.425. You made a profit of Rs.20/- on this transaction. In this transaction your first leg of the trade was to buy Wipro at Rs.405, and the second leg was to sell Wipro at Rs.425, and you were bullish on the stock. Going forward, on day 4, the stock is still trading at Rs.425, and you are now bearish on the stock. You are convinced that the stock will trade lower at Rs.405 in few days time. Now, is there a way you can profit out of your bearish expectation? Well, you could, and it can be done so by shorting the stock. You sell the stock at Rs.425, and 2 days later assuming the stock trades at Rs.405, you buy it back. If you realize the first leg of the trade was to sell at Rs.425, and the second leg was to buy the stock at Rs.405. This is always the case with shorting – you first sell at a price you perceive as high with an intention of buying it back at a lower price at a later point in time. You have actually executed the same trade as buying at Rs.405 and selling at Rs.425 but in reverse order. An obvious question you may have – How can one sell Wipro shares without owning it. Well you can do so, just like the way I sold a phone that I did not own. When you first sell, you are essentially borrowing it from someone else in the market, and when you buy it back, you actually return the shares back. All this happens in the backend, and the stock exchange facilitates the process of borrowing, and returning it back. In fact when you short a stock, it works so seamlessly that you will not even realize that you are borrowing it from someone else. From your perspective, all you need to know is that when you are bearish on the stock, you can short the stock, and the exchange takes care of borrowing the stock on your behalf. When you buy the stocks back, the exchange will ensure the stocks are returned back. When you are short, you make money when the stock price goes down. You will make a loss if the stock price goes up after you have shorted the stock. Square off ­– Square off is a term used to indicate that you intend to close an existing position. If you are long on a stock squaring off the position means to sell the stock. Please remember, when you are selling the stock to close an existing long position you are not shorting the stock! When you are short on the stock, squaring off position means to buy the stock back. Remember when you buy it back, you are just closing an existing position and you are not going long! Intraday position – Is a trading position you initiate with an expectation to square off the position within the same day. OHLC ­– OHLC stands for open, high, low and close. We will understand more about this in the technical analysis module. For now, open is the price at which the stock opens for the day, high is the highest price at which the stock trade during the day, low is the lowest price at which the stock trades during the day, and the close is the closing price of the stock. For example, the OHLC of ACC on 17th June 2014 was 1486, 1511, 1467 and 1499. Volume – Volumes and its impact on the stock prices is an important concept that we will explore in greater detail in the technical analysis module. Volumes represent the total transactions (both buy and sell put together) for a particular stock on a particular day. For example, on 17th June 2014, the volume on ACC was 5, 33,819 shares. Market Segment – A market segment is a division within which a certain type of financial instrument is traded. Each financial instrument is characterized by its risk and reward parameters. The exchange operates in three main segments. Whole sale Debt Market – The whole sale debt market deals with fixed income securities. Debt instruments include government securities, treasury bills, bonds issued by a public sector undertaking, corporate bonds, corporate debentures etc. Is it possible to short a stock in the cash segment for holding overnight or for long term? I thought only intraday shorting is allowed on cash segment. Absolutely. Shorting in cash segment is possible only on a intra day basis and not overnight. This toturial is absolutely brilliant and it’s framed in well manner to understand from beginners view. Can you explain about cash market and Equity market and what is the difference between these two. They both are the case, the terms are used interchangeably. Does this still hold true? Or can we now pick the option of sell today buy tomorrow? You can still do BTST, Kiran. What are Preference Shares and how these shares are different from normal shares? Preferred shares are shares allotted on a preferential basis. The preferential shareholders have few special privileges ( voting rights, claim on dividends etc). Think about the preferential holders as Business class travellers and common shareholders as the economy class travellers….but essentially they are all flying in the same flight. Preference share do not have any voting right. Preference shares are those shares which get a fixed dividend payout on face value if the company decides to pay out dividends. The rate of dividend is pre-fixed , for example, if a company issued 10% Preference Share Capital then the dividend to PS holders will be (FV*no.of shares )*10% . Whereas dividend to equity shareholders will fluctuate based on the remaining profits of the company after all pay outs. As ESH take higher risk because of uncertainty of dividend income (not to mention the higher return they enjoy during profit season), they get voting rights (used in General Meetings) and PSH do not have the voting rights. Because they get the first preference on claiming the profits of the company they are called as Preference Share Holders and the shares they hold are called as Preference Shares . True, thanks for the additional information, Sankari. can we short in future and options ? can we short overnight? In a scenario where I take a short position on a nifty put option at a strike price of 8400, which expires on 24th Dec 2014. 1. What happens on the expiry, if the nifty reaches the strike price? and what happens if it doesn’t reach a strike price? 2. If the nifty goes up and the premium for the 8400 strike price goes down. In this case I strike off my position. Which will be a profitable trade. Is this option available? 3. Assuming I took a short put option on nifty at premium of 50 rs, i took 4 lots (currently nifty lot is 25) which would cost me 5000 rs. If the premium of the above position goes up to 100 and I don’t have money in my trading account. What would be the possible outcomes on this situation. Since you are short on a Put, your expectation is neutral to bullish..
Kindly refer to your reply i. In PUT option, one will not loose money if price of underlying (Nifty here) is below the strike price of PUT (In the money) option and one will loose money if price of underlying is aove the strike price (out of money). Its a short put position, Akash. When i call my broker to buy shares how he would know whether i am buying for intraday or interday? do i need to tell specifically every time i call? Yes, you will have to. In fact the dealer at your brokers office will ask you this himself. If he doesn’t you will have to ensure you specify. Sure, maybe I’ll do this sometime soon. Looks like when you tried shorting the order type was ‘CNC’. Make sure you are shorting in ‘NRML’ mode and ensure there are sufficient margins in you account. Wouldn’t this be taken as “MIS” instead of “NRML” since it is a short in cash segment and has to be squared off intraday? I could’nt see NRML mode in zerodha. There are only CNC and MIS. NRML is of course there, its for Derivative contracts. Sir, is this style of trading , like taking short position is also called future trading or that is different? Though this chapter of future trading has not come yet. this is just a question of doubt. Thanks. You can take short positions in both cash and futures markets. The only difference is that in Futures market you can continue to hold the short till expiry whereas in cash market you will have to close out the position the same day. sir, please tell me what is future and options ? supposing only two traders ..i buy a share from other..what’s the volume? 1 or 2? It will be 1 as there is 1 share bought and 1 share sold. So now Volume is the number of shares exchanged in transactions rather than, sum of share bought and shares sold? I want to buy 100 shares – you may sell 50, another guy may sell 20, and another 30. Here Volume is 100, but number of transactions is 3. Volume here is 100 but number of transactions is 4 (1-buy and 3-sell). Possible, it depends on the number of sellers along with quantities they have to offer. (1) When I am shortselling I am actually borrowing the same stock from other market participant. Does the market participant know whether someone else is borrowing his stock? If answer is “no”, then if I forgot to square off, the stock will be debited from his account and after auction the same will be credited. Meanwhile if he check his DP Holding statement, of course he will know the whole thing…am I right? (2) Volume represent both buy and sell together. Why? Only buying / selling can count the volume…isn’t it? Why buy and sell is different? If I think some people forgot to square off at the end of the day, then those stocks goes for an auction and ultimately square off. Then it make no sense to represent buy and sell volume different. The volume information is like this – Assume I buy 100 shares and you sell 100 shares, volume for the day is 100 however the number of trades is 2 as both you and I traded. I decide to short a stock for say Rs.400(1st leg) and now if the price shoots upto say Rs.600. I dont have the balance amount of money to buy the stock(2nd leg) , What should I do ? So, the purpose of margin is to limit my losses. Meaning, I should play with that amount of margins, which I can afford to loose. Right? It is more than that, Rajat. Margins help in preventing defaults and smooth M2M settlements. The dividend yield percentage is based on the Dividend Received / market Price * 100 . That means as per your example for Infosys the dividend yield will be 63 / 3000 * 100 = 2.1%. i think you need to change the definition under FACE VALUE. True, I made the necessary changes. I’m a little confused with this sentence > “For example the FV of Infosys is 5, and if they announce an annual dividend of Rs.63/- then it means the dividend paid is 1260%s (63 divided by 5)”. What formula do we use to calculate? It is the percentage formula, Rabbi. There are more than 5000 scripts in stock markets. Can i go short on any script for intraday? Or is there any specific list of stocks which can be shorted for intraday in cash segment? For all practical reasons I would suggest you look for shorting opportunities within the Nifty 50 baskets or maybe CNX 100. Going outside this basket may not be worth the risk. When one loads the Market watch in Pi, the fourth column has several two letter codes — BE, BL, BT, BZ, D1, DR, EQ, H1, H2, H3 and so on. What are these two letter terms called? Is there any list available online which explains ALL these two letter terms? These are all difference instrument series as per the exchanges. Of all these series codes two you must know – EQ and B1. EQ stands for ‘Equity’ which is regular spot market. B1 is again equity but you cannot do intraday trade on these…meaning you will have to do only delivery based trades on B1 stocks. There there are these N1, N2 etc all these are bonds, debentures etc. Oh yes, this is one of the best explanations! the link doesn’t work now. Please share an alternative if anyone could. Here you go…copy pasted the post from the link! Adam – when there is a selling pressure the sellers get desperate and they want to get rid of their stocks (for whatever reasons it could be). Hence they would accept lower and lower prices for their stocks and hence the price comes down. A stop loss order is a one day order right? So say if I have 20 stocks in my holdings will I have to sit and place sell orders at my stop price everyday!? Isn’t there a more convenient way of doing this? Also are trailing stop loss orders also valid for just one day? Adam – unfortunately both stoploss and trailing SL orders are valid for the day and cannot be carried forward to the next day. So If I have 20 stock in my holdings, will I have to place SL orders manually everyday?? Isnt there an automatic way of doing it? Nope, placing daily SL is the only way now. 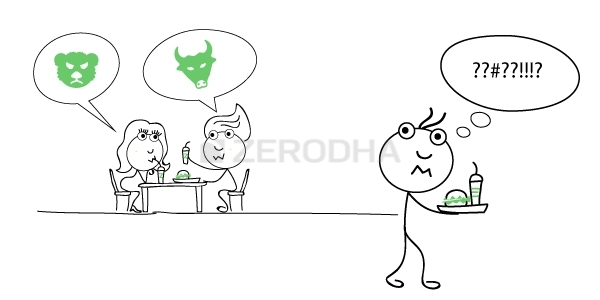 One last question….. How much does zerodha charge for BTST(Buy today sell tomorrow) trades?Is it the same as intraday brokerage? When you short an option you have unlimited risk, hence if the trade goes against you there would be a margin call. Disclosed Quantity is a disclosure method wherein you showcase only small bits to market. So doesn’t disclosed quantity give more possibilities to false volume figures? No as disclosed quantity is a subset of overall volume for the day. I do not think I understand what you mean here. Can you rephrase what you have written in these two lines and explain them. Assume you do not have Infy shares in your DEMAT. However you click on sell in the order form and sell 100 shares. Even though you do not have the 100 shares, your sell order will go through. And this will be facilitated by the exchange. Based on your statement, does this mean that I have shorted the stock with no intention of doing so? Yes, if you directly sell the stock without owning the stock, then you have shorted the stock, with or without your intentions to do so. If you are long on a stock squaring off the position means to sell the stock. Please remember, when you are selling the stock to close an existing long position you are not shorting the stoc k! – Does this mean squaring off means a complete order i.e both legs happen within the same day & if the order is sold from Demat it is not called squaring off ? Square off is a term used to complete an existing open position. Traders generally use it in terms of futures and options trades as opposed to DEMAT related trades. If you do this on intraday basis, it would get netted out and the balance would be open. For example you bought 500 shares, sold 300 shorts…you’d be net long 200 shares. Thanks Karthik for the clarification. I have been really enjoying reading all you modules, such simple and relevant examples you come up with! Fantastic! Keep up the good work! Currently reading Option theory. Enjoying every bit of it. Also have you come up with the trading strategies module, yet? Thanks for the kind words Arup! Not yet, we are currently working on Module 8 – currencies, commodities etc. Will start work on that after this. 1) If I have 1 lakh in my Demat account, what is margin provided by Zerodha for the intraday trades, is it like I can buy shares worth more than 1 lakh in my account even though I have already purchased shares worth 1 lakh. 2) All intraday trades for a equity should be closed on the same day or would I get to carry over to next day and how long can I carry over. Do we have extra charges for carrying them over as I have used the margin provided by Zerodha. 2) All equity intraday shorts have to be closed the same day. If you wish to roll over long trade, then make sure you convert them to CNC. If I selected my trade initially as MIS and then later in the day I change my mind and decide to hold the position for a few more days then is this possible? also, is it possible in the opposite case- ie, CNC first and later MIS for the same trade? Hi Karthik. I have a doubt. In the statement “If you have bought the Nifty Index with an expectation that the index will trade higher then essentially you have a long position on Nifty. If you are long on a stock or an index, you are said to be bullish.” What do you mean when you say If you have bought nifty index? As far as I was able to understand from previous chapters that we buy shares of company so I am able to make sense of the phrase to be long on some company’s share but I am not able to make sense of to be long on Nifty. Please explain this. Does this mean that to buy shares of some company listed in NSE? Hitesh – just like stocks, you can trade the Index (Nifty) as well. Trading in Index happens via the Futures and Options segment. So if I have bought Nifty Futures, I’m said to be long Nifty, likewise if I have shorted Nifty Futures I’m said to be short Nifty. When we short a stock that means we are borrowing that stock from someone else and selling to some other person. So my question is there any time limit under which we have to buy that stock after selling and return that to the person from whom it is borrowed? Well, shorting stocks (in spot market) works only on a intraday basis. So you should buy it back by end of day before the market closes. Hi Karthik! I can’t stop appreciating the beautiful work you and your team are doing! Wonderful for people new to share markets. Just waned to know, if you have any pseudo trading tool (or know of any such software/tool available anywhere), which mimics the exact market scenarios and people new to trading can use it to gain confidence before starting with actual trading? If not, I would kindly suggest your team to roll out something similar, as it will go a long way in implementing the beautiful theories you have given in the modules and get a hands on experience along with confidence before trying out the real thing with real money!!! Best wishes! my question i just simple, as i am just a beginner in intraday trading. the difference between a bid price and an offer price is , in a bid price a potential buyer intends to buy a stock at that price and the ask price is a potential seller wants to sell a stock at minimum price. so, if i want to buy in open market. i have to buy from ask price or offer price and similarly if am selling i have to sell to best bid price. it is right if come to a conclusion that more volume in offerprice where potential seller intends to sell indicates a bearish trend, as more amount are waiting to sell. and high bid volume suggeting more people are inclined to buy a stock. so can i come to a conclusion that when there are more bid volume ( more shares waiting to buy) indicate a bullish trend and more offer price volume ( where more people intends to sell at a said price) indicates bearish trend. kindly enlighten me. No Prakash, the bid-ask that you see constantly keeps changing, it reflects the demand-supply for that moment and nothing beyond that. Trying to over analyse this cause more harm than doing good. Sir, is it possible to add bid/ask ratio to the chart in kite. Zubin, I’m not sure but will get this checked. Thanks. If I have sufficient funds in my account, will the MIS orders still be squared off at the end of the day? Say I buy stocks in the morning worth 1 lakh with just 10 thousand by placing MIS order. In the afternoon I transfer Rs 1 lakh in my trading account. Will the the stocks bought in the morning still be squared off on the same day? Is there a way to hold it for longer duration at the same price bought earlier with margin? Will there be any charges or so? In addition to the above question…How long can a short position be held on derivatives. Can I sell call option today any buy one week later? MIS by default is an intraday order, so it has to be squared off. Apologies if this questions sound stupid. but wanna knw , is short trade should happen on the same day ? i mean if i forget to sell the stock at the end of day for returning then what would happen ? No question is stupid my friend. I want to check if this is a possible and allwed scenario. Day 1: Buy a share A at price 1000 for long in CNC mode. Day 2:Some bearishness forms on the share. Can we short this stock by selling high and buying low and still continue the long holding? are these types of trades allowed? Yes, day one you buy in CNC mode…and on day 2 you simply do an intraday trade under MIS/BO or CO.
Are BankNifty Options very liquid as compared to other Options? Yes, you can short sell – but on intraday basis in spot or in the futures. Previously we knew that regarding Transaction of equity shares, profits from selling shares which are held for 365 days or more, come under long term capital gain and are exempted from Capital Gain tax, but as per the Union Budget 2017-18, exemption under section 10(38) from income arising on transfer of equity share acquired on or after 1st day of October, 2004 shall be available only if the acquisition of share is chargeable to Securities Transaction Tax under Chapter VII of the Finance (No. 2) Act,2004. Does this mean that shares bought through ZERODHA will not get the benefit of Long Term Capital Gain in equity as ZERODHA did not deduct any charge while shares were purchased for the purpose of investment & holding in the Portfolio? For the shares you buy from Zerodha, STT is deducted, hence eligible for the LTCG tax benefit. Thanks, but when I buy shares for say 100/-, the value of shares bought is reflected as 100/-. If STT is deducted, then the value of shares bought should have been less than 100/-. I cannot understand this part. Is STT deducted at the time of purchase of shares? A strict reading of teh IT tax act does not allow STT as cost. Hence it is safer not to add STT as cost to the purchase price or deduct STT as a cost from selling price. In short, profit or loss will need to be computed excluding STT on both legs. Amazing efforts by Zerodha to have put this together for a complete novice like me. Thanks for the kind words, Ronak. The split depends on how the company intends to structure it. Split is reflected in the face value. Seed capital has nothing to do with it. 1) Can we short shares for a different price than market as done by your friend in the example where market price was not known? 2) In Volume doesn’t double counting take place? 1) If you place a market order in an illiquid stock, then you may get such prices. Sir, If i have buy CNC share of at Rs. 140 and i wish to sell it at Rs. 160. If there any formula/command by which i can set my sale price. Similarly can i set buy price for any share in CNC type so that i don ‘t eed to look in to market everyday ?? Unfortunately, you cannot carry forward orders on a overnight basis. This would limit you from doing what you are looking for. What does mean BZ , BE etc please clarify. Loss can occur when the stock price falls below the purchase price. Suppose the stock price starts to drop and you have decided to get out of the trade if the price falls below a certain price level, then that price level is called the stop loss. what general criteria should be adopted for stop loss? we will be thankful to you If you could write some tips or in details with citing examples. I’d suggest you check out the module on TA here – http://zerodha.com/varsity/module/technical-analysis/ , SL for each pattern is discussed in detail. What does previous close mean? It means the previous day close price? It means the previous day close price. Previois day close is 28 and the CPM is 30 , will closing price change to 30 if any one buy at the price of 30 or it will remain 28? You cannot change what happened yesterday right, so it will remain at 28. I when I first sell how I am borrowing it from someone else…. And then when I buy it back how I am returning it. Very hard to understand this part. I have only 5000 trading capital , is it possible for me to trade in option and earn profit . But frankly, 5K is bit tight. Please use this money to invest in a stock or two and experience investing for long term. what about doing intraday with 5k as I’ve bit knowledge of intraday and what is the minimum capital to start with options trading? Do you have your office/representatives in Pune? If yes, please text me the address and contact number on 8983559413. I’m absolutely loving the varsity. What I want to ask is, if it’s possible to short in delivery. I’ve only heard of shorting in MIS on Kite. But can I sell the share today and buy it back maybe tomorrow or some days later? No, shorting for delivery is not possible. For every buyer there needs to be a seller and vice-versa, right? Then how is the volume actually calculated, what it actually signifies? Suppose I have one chocolate and I sell it to my friend. If we calculate the volume, simply, as sum of sells and buys, it comes comes out to be 2 chocolates. But this doesn’t make sense, because there was only one chocolate which changed hands. And even after the transaction there is only one chocolate. Number of trades is 2 and volume will be 1. In a bull market, buyers are willing to buy at any price the seller wants hence the prices tends to go higher. Likewise, in a bear market, the sellers are desperate to sell at any price, hence the price keeps dropping. Is there a way to know how many short position that are open? When doing short, from where its borrowed? Seems there is virtual outstanding shares which is increased. Looks like its only money transaction being made. End of the day if no one is selling, how will the short position close? You can look at the OI data and figure out how many shorts are there. However, you cannot know this in the intraday spot market. End of the day if no one is selling – then the procedure is different for different segments. Suggest you read the module on Futures trading as well. The way shorting is explained is great. I have one doubt and request you to clarify or share your inputs. Shorting, i.e, selling can be done only in intraday or f&o contracts right? They can’t be done with CNC (Btst). Am I right? Yes, you can only short intraday in SPOT. However, you can carry forward your short position in the futures market. It will reduce to the extent of the bonus announced. First of all thanks for the wonderful material throughout the Varsity chapters. I have one question here w.r.t the above question on bonus and it’s impact on share price. Is there any way one can calculate using mathematical formula the expected decrement in stock price because of the bonus announcement. If yes, can you please elaborate how to do the same. Yes, the math is already explained in the chapter. Can you kindly go through it once? Have explained this in the chapter itself, with illustrations. *when company announce an annual dividend of Rs.63/- then it means the dividend paid is 1260%s (63 divided by 5). 1.okk but 1260% of what?? 5) An asset class is something that has a future economic value. Security usually refers to Equity. and what is market segment?? If the dividend per share is Rs.63, then you will get 63. Market segment is different segments within capital markets like – Currency, Equities, Derivatives etc. If you buy a stock, then square off means you sell the stock to close the position. If you short a futures contract, then square off means you buy back the futures to close the position. In general, an action which will close an existing position in the market is referred to as square off. 2. Shorting for Equity can only be done on an intraday basis. At Zerodha, the scrip you short will be auto squared-off (Bought) at 3.20 PM. Can you kindly elaborate, please? Thanks. It should have credited to your account, suggest you give a call to the support desk for this. I have bought one script which shows now this is BZ series. I couldn’t able to sell this script now in Zerodha. My request was rejected. Could you please assist what BZ series mean? Why didn’t I able to sell this script in Zerodha? I’d suggest you call our support desk for this, please. Thanks. i am having an account with ZERODHA .i want to give an suggestion that is it position to add 4 hrs chart option as well in zerodha kite platform. Click on the 1 month time interval below the chart and it automatically changes to 4 hours candles. How to convert an already processed MIS order (stock purchased) to CNC? Can I take the delivery of a stock purchased on MIS as I don’t want to square it off at a lower price as due to fall in price, I have changed my plan suddenly? In the Positions page in kite, you can click on the arrow key corresponding to your position. It will give you the option to convert to CNC(Only for long positions). Please check the User Manual which contains the detailed explanation. sir i want to know about sgx nifty(i.e.singapore) and its connection with indian nifty,how this sgx nifty affects the price of nifty before opening of indian market which leds to gap up opening,i want to know this in detail,plz tell me. SGX is Nifty futures traded on Singapore stock exchange, just like the way Dow is listed on NSE. It does not really have any effect on Indian markets. Rather, SGX follows Nifty movements once Indian markets open. However, before the Indian markets open, traders look for the prices of SGX to get a sense of where the Index could open. I did not understand the part about the FaceValue Can u please give me a better explanation? Face Value is the nominal value of a share. This is the notional value assigned at the time of creation of these shares. Usually, Rs.10, 50, and 100 are quite a common face value of shares. I’m trying to place a short sell order on a stock but it gets rejected. in the comments it says “check holdings ,no holdings present” and “across exchange across segment across product”. Can we go short only in F&O? and if not then how do I execute a short order on a normal stock? You need to ensure the product type is MIS and not CNC. Is shorting possible in equity?? i understand and as mention in the blog related to BTST/ATST( Buy/Acquire Today Sell tomorrow) Zerodha does not allow to sell the shares unless we have it in our Demat account in order to avoid the defaulting situation. But in the chapter you mentioned that while shorting exchange borrows the shares from other market participant and delivers it..
Could you please give me clarity regarding this. Shorting in equity is possible only on an intraday basis. However, for the overnight short position, you can always use derivatives. By expiry it becomes 0.05 and I’m holding it after expiry. Do I hvae to pay the stt ? I mean my maximum loss is 2*1000 + brokerage + tax right? or anything more than that? The loss will be the premium paid plus applicable charges. I had bought URJA GLOBA on BSE as CNC. My holdings are reflecting it as “URJA-BE”. I dont understand. The URJA GLOBA closed at 11.40, i had bought at 9.7 average cost. But the holdings are showing a loss at a closing price of 9.5. I don’t understand this. Please help. Ritu, although you had bought the stock from BSE, Kite will by default show the NSE price. You can still choose to still the stock in BSE which is trading at a higher. If in first leg i will sell first at Rs 459 /-. to buy in second leg at Rs 441/- ..how will i benefit in this bearish situation ? This is as good as buying at 441 and selling at 459. Its just that you sold first and bought it back later. What is the difference between face value (fv) and stock price ? Face value is the notional/nominal value of the share assigned at the time of share creation. Stock price is the price discovered by the markets. If I wish to short a stock today, how to be sure that the stock has been shorted by me (the concept is not clear) and if it is shorted today after how many days can I buy that stock ? The short position will reflect in your positions tab. You make money when the shorted asset goes down in value and lose money when it goes up. If you short in EQ, you can hold the position for only the day. If you short the position in Futures, you can carry the position forward overnight. Can I buy a stock in BSE and sell on intraday in NSE and vice versa (I mean arbitrage) ? Also tell me in detail whether can I do this for buying a stock in BSE and sell on next day in NSE and vice versa ? No, you can buy on BSE, take it to delivery and after few days sell it on NSE. Intraday is not possible. If I have 500 in my account and I decide to short a stock at 400, if the value of that stock keeps rising forever way past what I have, could I get away with never having to square off the position? All short orders in EQ is squared off on an intrday basis. You cannot carry forward the position overnight. For overnight positions, you will have use the futures. in above para its written : Volumes represent the total transactions (both buy and sell put together) for a particular stock on a particular day. For example, on 17th June 2014, the volume on ACC was 5, 33,819 shares. also note : every seller has buyer. so if 6 shares are bought then 6 would have been sold by seller. so volume should be multiple of 2.? I buy 10 shares from you, this means 10 shares were bought and 10 were sold – so the volume is 10+10 = 20. In the above example of ACC the volume on ACC was 5, 33,819 shares, meaning the number of ACC shares BUY=SELL= 5, 33, 819. Right? Explain which part of the chapter, Shishir? Dear Karthik Sir, Thanks for your valuable reply against my query about deliverable quantity & traded quantity. You can look at the OI data and figure out how many shorts are there. Please elaborate how the Open Interest data can be used to find out the no. of SHORTS ? Is the difference between the CALL side OI and PUT side OI the no of Shorts available? Does my assumption is correct sir? Nope, there is no difference as such. As you might be aware today that Rcom shares surged 59% in a singled day session, i am really intrigued. Isn’t there an upper circuit limit of 20% on the movements in a single day on Indian scripts. I googled but didn’t find much info.Please clarify? I have few shares of Vakarangee LTD which now trading in BE-series. I am trying to sell these shares without success. Is there a way to get out of these stocks asap ? Mahendra, unfortunatley it’s hitting lower circuits everyday. Your only option is to place an order (market) every day as early as possible. Hello sir ? Suppose some share closed at rupees 100 on Monday and it opened at 110 on Tuesday, so does it mean that the first trade that executed on Tuesday was at 110 ? Also sir as you said that a stock cannot move more than 20% in a day, so this 20% is of the opening price ? Some stocks have a 20% restriction, some have 10%, some have 5%, and some have no restriction at all. The limit can be breached any time during the day and not necessarily at the opening. Yes. This is also called a gap up opening. I have a simple question. Can there be ever situation in India, in which retail investors are banned from investing in stock market ? I am talking only about investing and trading in stocks by retail investors in cash segment … NOT the derivatives. Can there be ban on retail investors to invest or trade in stocks ? No, I dont think that would ever happen as it would defy the very purpose of capital markets. Thank you sir, I got it what you are telling, just one last query sir ,,, that SEBI argues that in F&O , retail investors make losses and do risky trading which they are not aware of much,, and trying to put them somewhat away from it. Similarly can they not say that retail investors make losses in investments in shares or trading in shares … so that is the reason to ban retail investors from investing and trading in shares (cash market) and instead allow retail investors to invest ONLY through MUTUAL FUNDS and not from themselves ? Is this a possible situation according to you sir ? My query is regarding 52 week high and low. When the price of the stock reaches 52 wk high,it indicates bullish trend. So,is this the right time to buy that particular stock or should we wait for the prices to fall down to its lower side? I would prefer to buy at a retracement, Deva. i did not get this..can u pls explain further. To plot S&R, the stock should be trading between previous high and low, if the stock is continuously making new highs then there is no reference point. Hence it is not possible. one more query,though it is not related to this topic- Mutual funds are also subjected to market risks,then why is it relatively safer to invest in this than the stocks? Becuase the MF is well diversified and is managed by professional fund managers. sir , does face value changes on daily basis ? or it is fixed forever ? No, it does not, changes as and when there is a corporate action like a stock split. Best Explanation for ‘short position’ I have ever come across. Thank you so much ! I bought a partly paid shares of IBventures through zerodha. Now the share had stop trading as they have made first call on shares but i dont undersatnd how will i be able to pay them via ZERODHA. Please help. I m very new here bought the shares without knowing its partly paid. What is partly paid shares, Sourabh? Can you share the instrument name or ISIN? Mainly during IPOs, the company chooses to receive money on shares in different portions at different times. For example- X Ltd. issued 10000 shares of INR 10/- each at a premium of INR 20 /- , and they call only for INR 15/- first then INR 150000/- is called as Share Application Money. Then the company can choose to call for the rest of the unpaid money at once or in sections. That call made after the application money is called “First Call Money”. If the above co. makes a call of INR 10/- then INR 100000/- will be recorded in their books as First Call Money. So on and so forth till all the unpaid money is received by the money. Sankari, I’m not sure if this is still the practice. Oh I’ll check it out once then. But still partly paid up shares means those shares that are issued but not fully subscribed or paid up. Sir I have a doubt regarding shorting. From the point of view of the back end lender who is lending his shares for someone who wants to short, what is the benefit he is going to get when he receives his shares back from the borrower or trader? Well, theoretically he has lent the money for a certain borrowing fee. You mean the lender has lent the shares for a borrowing fee. Thank you. Can a regular investor or trader lend shares for that purpose? I have a doubt on Shorting. Just for a trial I sold the Stock of some company, which I dont have bought earlier (Holding “0” for that particular stock), when I placed “Sell” order without owing it, the Status of the order shows as “Rejected”. I am still confused with Shorting. Awesome description & thanks a lot to teach in very easy way . One suggestion is to have next and previous chapter link on each page . Thanks, Pulkit. In fact, the next and previous buttons are already there at the end of the chapter. what is d1 series in nse? Arvind, I guess these are fully convertible debentures. Sir,what does BZ series mean? BZ group contains stocks which fail to comply with Listing Obligations and Disclosure Requirements (LODR 15) of SEBI. Squaring off concept used after purchase of share or before purchase of share. Please guide me in both the cases. To square off a long position, say 100 shares of Infosys, you will have to sell 100 shares of Infosys. To square off a short position of 1 lot of Infy, you will have to buy back 1 lot of Infy. Yes, you can partially sell your holdings. Two more doubt in this chapter. 1. What does mean of 52 week high/low. Is it mean last financial year 52 week high/low or back from the present date. This highest price is in FY 2017-18 or from 28/12/2017 to 27/12/2018. 2.Short position is done in intraday only or it can be done in delivery as well. Someone told me that if i short share and don’t buy it back same day before closing the market then may be penalty imposed by stock broker or NSE or BSE. after a bonus issue or stock split, as seen in some of the stocks quite often the price tends to correct to the extent of bonus or split announced, so my ques to you is WHY. Why someone wants to sell so heavily that the share price falls, its a loss for every investor, they are easily getting their money doubled by getting double amount of shares, overlooking the fundamentals, why market participants wants to drag the price down of the scrip, skip the fundamentals part just talk technical. Mohit, the fall in the share is not because of selling, but rather due to the adjustments made due to the corporate action. I’ve explained this in the chapter. well, if the fall is not because of selling so who adjusts this price, I mean if people are not involved in dragging the prices then who adjusts this price exchange or company, because somebody has to tweak something in order to change the price of stock getting my point. The exchange does the adjustments to the prices. ok so if exchanges tweak the prices to the extent of corporate action, then sometimes in some stock it has been observed that after the bonus or issue the price didn’t changed much, why is that. Can you share the name of the scrip, Mohit and the exact date of the corporate action? What’s the difference between upper and lower circuit and upper and lower price band. The circuit limits are like upper and lower bound range within which a stock can trade for the given day. In the event, it touches those limits then the stock freezes for the day.